nocertaintyonlyadventure | She was there. All pink and gold and glittery. This September will mark the FIVE YEAR anniversary of the first time I ever set foot on European soil…And with that realisation, comes an extraordinary amount of reflection; reflection on my time in London and reflection on my time since. At least once a month I come back to this blog and I read it from start to finish. The posts are like love letters from an ex-fling: they taunt and they tease, but they remember and they reminisce it’s hard not to cherish them. I’m so often asked if I miss London and the answer seems so obvious to me. I miss it every single day. I wake up every single day feeling like a part of me is missing because my one great love is an ocean away. It’s the single most devastating, never ending long-distance relationship anyone could have. I miss the sights, I miss the smells, I miss the people, I miss the freedom. But I think what I’m really missing, deep down, is the girl who moved there 4 years ago. She lived with abandon: no fears, no regrets, no rearview mirror. The car moved only in forward motion, with no desire to ever shift into reverse. In that city I was the best version of myself. I was carefree and adventurous. Curious and open. I knew nothing about the world but did everything I could to memorise it inside and out. True love opens you up and makes you vulnerable, exposes every piece of you that is rare and real. But one never has to worry about those pieces being damaged because true love doesn’t hurt. In that city I was open and exposed, but those tender parts were never damaged. Because I trusted that city and it trusted me. It opened itself up as much to me as I it, and we both escaped our one year relationship unscathed, with nothing but positives on which to focus. I find myself reflecting on these times so often because I want that abandon back. I want to live freely, full of adventure. Since moving home I have found my great love in a different form, a form that is very much a part of this adventure. My human London. And I am ready to see where that adventure leads, but I’ve been living with no adventure, only certainty and it’s time to go back to the reverse. Throughout the past five years, I’ve watched my rearview mirror get so large it’s obstructed the view in my windshield. I have lived an incredible life with experiences some could only dream of- but they have been few and far between. I have focused on fear and comfort, two things I am very unfamiliar with but that lately have been taking over. Perhaps this is what growing up is about- thinking smarter and harder about life’s next steps. But this creates the reality of simply existing rather than living. If I have learned one thing throughout the past five years it’s this: it is okay to miss the past. It is okay to change and develop into a new person, but only if that person evolves. I have regressed in my growth. I have allowed London to act as the pinnacle of what success looks like in my life. I don’t know if this is the unofficial re-opening of this blog, but it is certainly an unofficial re-opening of myself. Because we all need an outlet- one that hones our expressions and allows us to feel. In my time drudging through corporate America, I have lost all feeling. And this is an attempt to get it back. It’s another thing I can thank that beautiful city for- giving me a free pass to reflect and realise what’s missing in my life and how to get it back. I will ALWAYS hold that city closer to my heart than most things or people. If it can move on and change without me, then I can move on and change without it. And when the day comes where we can reunite and be together again, for however long, we will embrace each other with open arms. But for now , I will work to live life by the only rule I set for myself five years ago: to live with no certainty, only adventure. Back in March I applied to a week-long program run by the American Pavilion called the L.A. Intensive Student Filmmaker Program that would allow me to spend 9 days learning the ins and outs of the entertainment industry. Admittedly, I was a bit skeptical that I would be one of the chosen few participants, but April rolled around and I received my acceptance letter. So this was it- I was headed out to Los Angeles to continue chasing my dream. I landed on the afternoon of August 3- the L.A. sun welcoming me in and after a death-defying ride to UCLA, I was ready to begin. The first two days consisted of introductions to the other participants and to the city itself. We had come from all over the world, but fell into step with one another rather quickly. There’s something to be said about being surrounded by a group of individuals who share the same dream. Individuals who know what it is like to want to try a hand at one of the hardest businesses around. Individuals who understand that although this business is greedy, fickle, unpredictable and gluttonous, it is also passionate, creative, thrilling and rewarding. An undocumented understanding between nine individuals, the understanding that although this business creates a life full of bumpy rides, there is no other business that could elicit such passion and the choice to chase this life is a non-decision. So together, we spent eight days reaffirming our decision to “make it” in Hollywood. These nine days gave me the opportunity to reaffirm my passions and I am so thankful to have been given the opportunity. I lived the business for a week and a half and it was hard to allow that experience to end. For a business that is notorious for preying on the weak, I felt ready to take on the challenges. The program could not have kicked off in a more successful fashion. On Monday we ventured to FOX where we were given a private tour of the studio lot. This was a particularly special tour, as the FOX lot is not open for public tours. For me, this was the highlight of the week. It was great to have an opportunity made available to us that we would not otherwise have; but perhaps the real reason is because during the tour we happened to walk right by one of my favorite actors, Jake Johnson, from New Girl. We also caught a glimpse of the young actor who plays Manny on Modern Family as he was being driven around the lot in a golf cart. Continuing our celeb-spotting spree, we moved on to Sony ImageWorks. As luck should have it, we ran into Bill Hader, Anna Faris and Benjamin Bratt who were on hand for the Cloudy With A Chance of Meatballs 2 press junket. Tuesday began with a tour of Universal, which I always find to be quite a fun studio lot. Although I’ve been here numerous times, it provides a very interactive view of filmmaking and is an experience I will never tire of. Following Universal was a tour of Mole Richardson, the go-to lighting supply company in Hollywood. I have never been much a fan of lighting (perhaps because it is not a strong suit of mine) but I enjoyed the demonstrations, as they perfectly exemplified how important lighting and cinematography are to the moviemaking process. I certainly developed a new appreciation for the field. Wednesday we began the day with a roundtable discussion that was comprised of a group of young, emerging filmmakers. Their first film is currently making its rounds among the festival circuit and I found their discussion to be the most captivating, above all others. This is a group of three individuals not much further ahead in their careers than any one of us. Although they have a successful film under their belt, I got the feeling that they have as much figured out about this business as I do, which isn’t much and that is refreshing. There was an unspoken reassurance that it’s okay not to have everything figured out, it’s okay not to understand this business because success will still find you if you’re dedicated enough. Following a tour of the Sony Post Production studio, we had a roundtable discussion with Ty Warren, the SVP of Legendary Films; the production company that has brought you films such as The Town, 300 and The Hangover, among others. As someone very interested in the producer role, I was quite enthralled by Mr. Warren’s discussion. His position is certainly something to be desired and we were incredibly fortunate to have been given the opportunity to speak with him. As the day gave way to night, we were ushered back out to the Screen Actor’s Guild where we were given a private screening of the film Feeding Mr. Baldwin, followed by a discussion with the cast and crew. For as incredible as the talks were with the industry big-wigs, these were the moments I appreciated most- sharing time with those who, in one way or another, are just like us. One could easily have swapped out panel members and the experiences would have been the same; although this cast and crew had Hollywood work under their belt, I could still see the stars in their eyes- they were still fully in this business for the passion and wanted nothing more than to share that passion with us. Thursday we began the day with a very special opportunity that gave us a true insider’s look into the industry. An event never open to the public, but given to us so we may truly experience what it is like to be a part of this world. Unfortunately I cannot share any more details, but know that it very successfully opened my eyes to the inner workings of the industry. After an afternoon of panels, we were treated to a viewing of the four winning films entered into the Cannes Film Festival Emerging Filmmakers Showcase. Four very different films were showcased, all very poignant in their own ways. Again, there was the experience of feeling not so far away from the success that was put before us. Following the showcase, we attended a reception that allowed our group to network with members of the industry. I was very graciously introduced to an individual quite influential in the PR world and I’m looking forward to seeing what kind of doors that opportunity will open. For me, Friday was the day that best exemplified exactly what it would be like to live in this industry. We traveled to Asylum films where we were treated to a tour and a question and answer session with the founder of the studio. Following that, we headed over to the Warner Bros. lot, which happens to be my personal favorite. A number of my favorite films and television series have been shot here and it is always interesting to see how the sets change from year to year. (The highlight for me was my visit to the Pretty Little Liars set, otherwise knows as Rosewood.) While on the lot, we met with Donald DeLine, an incredibly influential and successful producer. As pointed out to us, we will likely never be in the same room as him again unless we ourselves become equally as successful. Although the conversation was short, it was a humbling experience to share 15 minutes of time with him. After the meeting, we headed over to a soundstage for a taping of a new CBS show called “Mom”, starring Allison Janney and Anna Faris. I have been in a studio audience before, but never for a sitcom and it was quite the experience. It takes approximately 6 hours to shoot a 22 minute episode and my attention was captured the full 6 hours. I like to say I have a fairly good idea of how things run on a television set, but it was so interesting to see it played out before my eyes. It is definitely something I would like to experience again, perhaps from the other side of the stage. Saturday was our last day as “professionals” and after a full day of panels, we were treated to Oscars Outdoors, which is an event held by the Academy of Motion Picture Arts and Sciences and again, privy only to those in the industry. Every Friday and Saturday, the Academy screens a different film and we were treated to the Bollywood film, “Monsoon Wedding”. To go along with the theme, a woman was giving out henna tattoos so all of the girls in the group decided to have our hands decorated with traditional Indian artwork. Sunday, after a final group breakfast, we all went our separate ways. Some stayed on for an extended vacation but I was off to LAX, headed for home. Going into this, I knew I would be gaining experiences some could only dream of, but I never anticipated walking away with eight new friends. Friends who share the same passions and desires and who want this is badly as I do. As I’ve put it once before, there are individuals who are in it for the love of the game, not just the love of the fame. I don’t know where this journey will lead me, but I’m excited about the prospect of finding out and can only hope it will turn out the way I wish it to and why shouldn’t it? After all, Hollywood is a big fan of a happy ending. 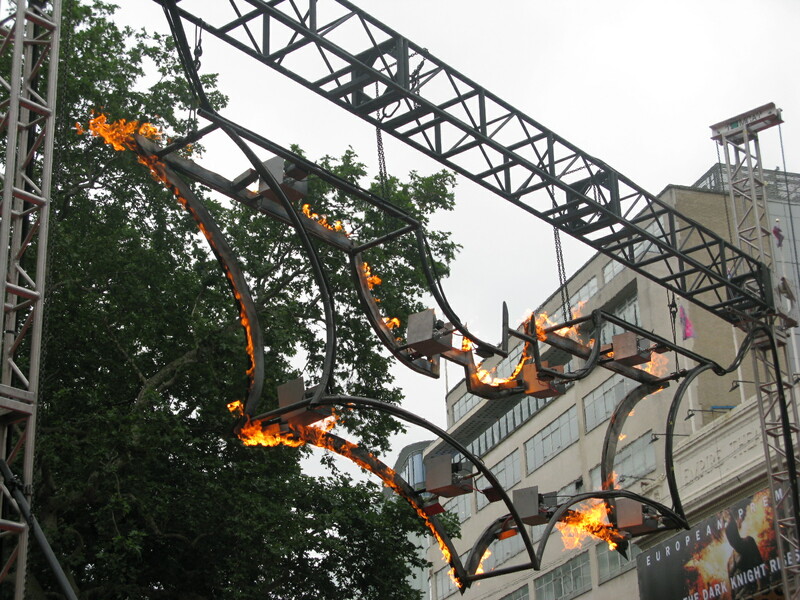 My time in London has come and gone once again and I was right- it passed by in what felt like seconds. I’ve never experienced a feeling as great as the one I experienced when I stepped off the plane and onto the soil that feels most like home to me at the moment. It was like seeing an old friend and knowing nothing had changed. I had to leave London behind for a period of time but she was forgiving and accepted me once again into her arms, allowing me to come home. As soon as I left Heathrow, I headed to Jordan. What an amazing reunion that was. The test of true friendship is, as they say, not about being together, but being apart and having nothing change. Four months apart did nothing to lessen the bond we formed so quickly last September- we simply fell right back into step. Because no one does Christmas better (or more glamourously) than London, I decided to go ice skating at Somerset House the night of my return. It felt like an appropriate way to celebrate. Somerset House is an iconic London location and in my opinion, one of the most beautiful buildings in the city and the skating center they have set up certainly does not disappoint. Surprisingly, I managed to stay on two feet the entire time, despite there being a few close calls. I was joined by a friend of mine, Maria, and we both did a pretty exceptional job of pretending we knew exactly what we were doing. The days that followed consisted of catching up with old friends and reacquainting myself with the city I hold so dear to my heart. I spent most of Sunday wandering around by myself, visiting some of my favorite spots in the city. Obviously checking up on Buckingham Palace to make sure my future home is in order. 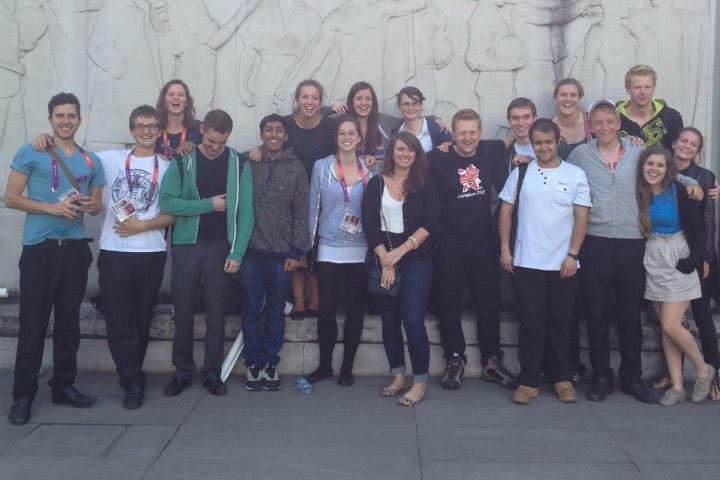 On Monday the culmination of my efforts as a grad student was celebrated at the Royal Festival Hall on the Southbank. It was graduation day. 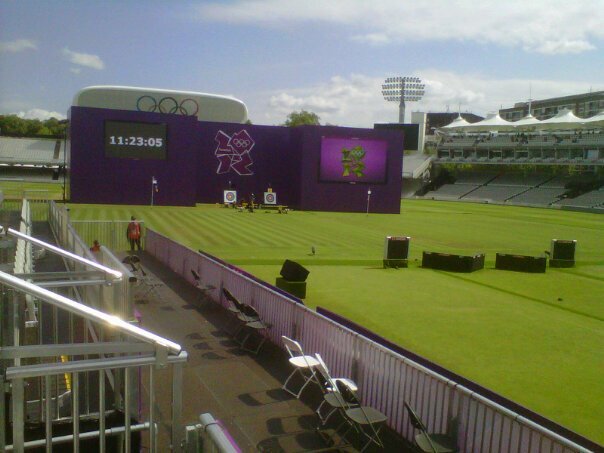 I expected pomp and circumstance (literally), after all, we were in England. Disappointingly though, I was let down. There was no procession, there were no horse-drawn carriages, there was no Queen. It was simply a ceremony where our names were called, we were ushered quickly across the stage and we were forced to sit through a speaker who, we were all quite sure, had had a bit too much to drink before the ceremony. I think my penchant for royal watching has left me overestimating the way the British organize every celebration. From now on I know to work on my standards and save the glamorous expectations for my wedding to Harry. Despite every activity and milestone that may have occurred while I was in England, there was one happening that no one could have predicted- one that I must admit has me the most excited. If you’ve guessed the royal baby announcement, you know me too well. What timing on my part to have been there when the palace confirmed Kate’s pregnancy. Harry and I are thrilled to be and aunt and uncle. He’ll be amazing, I’m sure. As I’ve been asked many times, I have no preference whether it’s a boy or a girl. Only that it would be quite exciting if it’s a girl given the new rules that have been put in place, stating that the first born to Will and Kate will inherit the crown, whether the child is male or female. (Obviously the current rule is that the first born son would take over). For two of the days, I decided to take a break from the fast pace of London and slow life down a bit up north. On Wednesday I visited a friend in Nottingham- a city about an hour north of London. There isn’t much to say about Nottingham save for the fact that it’s where Robin Hood stole from the rich and gave to the poor. Pity he isn’t still carrying out that duty. A few extra pounds would have been helpful. Thursday I trekked up to the North East and visited a friend in Durham. To give you an idea of just how far north I travled, Durham is just one stop away from the England/Scotland border and it was absolutely frigid. London was a tropical oasis in comparison. Despite the cold, Durham is a lovely town. It’s incredibly old- there are no streets, just cobble stone paths weaving up and down, separating the buildings. It’s a very quaint city but incredibly beautiful all the same- the heart of the city is Durham cathedral, an exceptional structure built in the 1000’s. Thursday night I traveled back to London, where I spent the rest of my time in England. Although it was a quick trip, I feel so fortunate to have been able to return, if only for a fleeting glimpse of time. Leaving in September was difficult, but there was always that knowledge that I’d be returning for graduation in 3 months time. However, leaving this time felt much more finite and the idea that I don’t know when I will return is absolutely terrifying, but I will work tirelessly to find a way back. However, for now, I will continue to dream in the colors of the city I call home and hope that when I do return, she will still have her arms open, ready to accept me back in. I’m sure you’re wondering what I’ve been getting up to since my move back home to America. 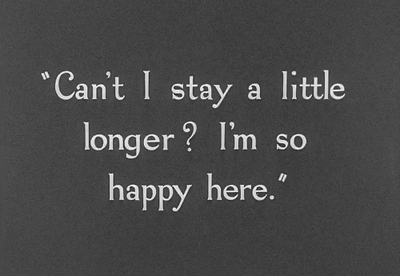 Well, the long and short of it is: not much. I’ve been fortunate enough to get a job as a nanny in order to pay the student loans that have been piling up since 2006, which means I’ve not been so fortunate in finding a “real” job. When you spend a year in London, the land where everything seems to fall into place, it’s difficult to come back to a situation that feels beyond all control. Upon my return to the States, I admittedly felt a little lost. My friends were oceans away. I’d been plucked from the place that’s felt most home to me. And the realization that it’s much harder to find Prince Harry in a Delaware Target than it is roaming the streets of London was almost too much to bear. If I’m being honest, that feeling of being lost hasn’t actually gone away. It hasn’t even lessened. As each day goes by it just gets a little bit easier to hide. I still wish I could turn to Jordan and have a laugh about the fact that I’ve just fallen on my face in the middle of a store. (Although for that one I did have my mother, which is just as good. I’m graceful to the outside world, but only she will ever fully understand my true inability to stand on two feet.) When I’ve got to dart around town from errand to errand, I long to ditch my car keys and trade them for my Oyster card. (Who would have ever guessed my preferred method of transportation would become public transport.) But that’s what London does- it changes you. The changes were easily adaptable in England, but brought back to America I just feel like a fish out of water. London has made me the best possible version of myself so far. However, I’m putting in every effort to make the most out of the situation I’m in now. And it’s not a bad one by any means. It’s just…different and I’m coping. However, for the next ten days I get my old life back. 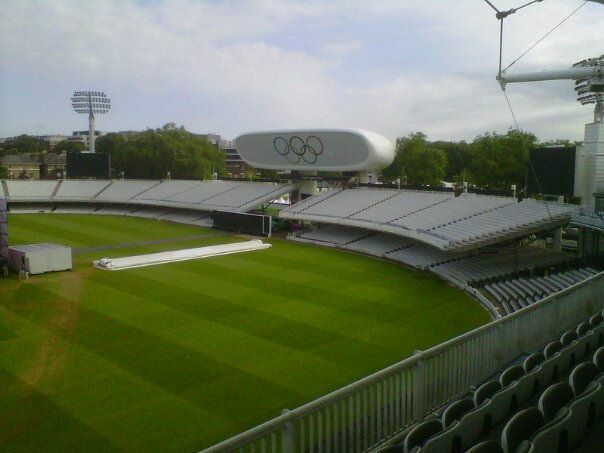 I get to take this new self and put it back where it belongs- in London. I’ll have my friends back- the ones who fully understand the power of leaving a journey like this one and what it means to set off on that journey once again. The time it’s taken to get to this point has felt like decades and I know the ten days I’m there will feel like seconds. However, I cannot wait for the rejuvenation that London will provide. I’m finally getting thrown back into the ocean (A horrendous analogy to make two days before flying over the Atlantic.) and even though it’s only for a short period of time, I can’t wait to step off that plane and get back “home”. The next week and a half is sure to be filled with laughs and adventure. I hope you’ll step back into this journey with me. It’s only right. For old time’s sake. You find no man who is willing to leave London, no sir. For when a man is tired of London, he is tired of life. I’ve been writing this entry here and there over the past month or two, reflecting on what the past year has meant to me. My mom asked me just this week why I love London as much as I do. I’ve discovered that there are no words meaningful enough to even begin to allow you to understand the past 365 days of my life. But I think that that is the test of a genuine love- when there are no words to describe why you feel the way you do. It’s just a feeling, an absolute certainty that where you are or who you’re with is exactly where you’re supposed to be. I’ve never been good with feelings, so I’ve done my best to TRY to explain what this experience has meant to me and I hope it will bring you a little closer to understanding. 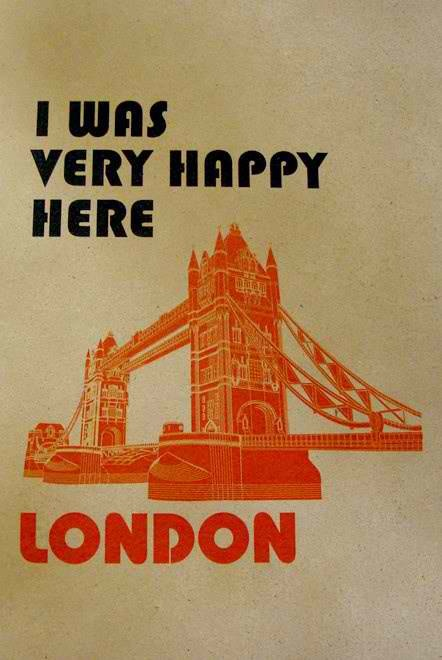 The prospect of moving to London began as a simple thought, that with time, became reality. When I walked off the plane and through Heathrow Airport, I had no idea what I had gotten myself into and that was the adventure- the unknown. I do not know how to escape this adventure, though. Part of me thinks I don’t have to, but the other part of me is saying that it is time to move on, to find the next big thing, because the world is too large to use up all of my adventure in one place. If I don’t get out now, I might not ever leave and I’ve got to keep going while I’ve got the time to be me and do my own thing. One thing I’ve often discussed with friends here is that no matter what, I will never get over the fact that I will no longer be living in London. I will hear the word and feel disappointment, knowing that it is not a place where I still reside. But it will always be home. Because home is not where I am from, but the places where I leave a piece of myself behind. And London will forever hold a piece of me. I can share my journeys with you and you can live vicariously, but you will never fully understand what it meant to be here. What it meant to leave everything behind and start anew in unfamiliar territory. I am famous for my inability to show emotions. However, as I sit here writing this, I can tell you that I am overcome by several emotions and I am absolutely heart broken about the end of this adventure. I’ll do my best to convey my emotions to you through words, because that’s the only way I know how. Sadness: I don’t know how to live a life outside of London and I am incredibly sad knowing that I’ve now got to figure that out. Living in Delaware was the only thing I knew for 22 years, but while it was familiar, I knew that there was somewhere else I was meant to go and I’ve found that place. Fitting into London life proved to be completely easy. I am comfortable. I am home. I do not know how to find that somewhere else. I can confidently say that I know I will find it somewhere down the road, but doing so will not be easy. I am also saddened that you will never fully know what it is like to live this journey that I have lived for the past 365 days. However, this also makes me grateful. Gratitude: Grateful that you will never know what this journey has been like, for this is an emotion that I can share only with myself. A feeling between a girl and the city she loves so dearly. An emotion that I will also share only with those who have been here with me. For they too know what it means to drop everything and run towards something great. I am grateful that my aunt took me on a European vacation in September of 2010- that fateful moment that brought me to London. The moment where the course of my life changed in ways I’d never imagine. Grateful to my parents who agreed to allow me to follow the dreams they’ve always encouraged my brother and I to have, even though those dreams took me 3,000 miles from them. For having the faith to know that I’d still make them proud, regardless of where they’d find me on a map. For understanding that this was a move I had to make for myself and no one else. A move that allowed me to be completely selfish. We’ve had our differences throughout this process (and still do, to a point), but know that the appreciation I have for the support you’ve shown is insurmountable. That when I say thank you with an expressionless face, I’m actually saying thank you from the absolute bottom of my heart. I know that the arguments don’t end here, but I’m humbled that you’re fighting for the things that are best for me. To my friends from home for allowing things to be the same when we reunited at home. For taking the time to Skype and e-mail. For understanding that while I have changed, I am still the Sarah they knew and loved before I left, and for realising that moving to London didn’t mean that I had moved on from them. I am grateful for the friends I have made here in London. For knowing 100 percent what this experience feels like and for sharing those feelings with me and allowing me to do the same with you. For surpassing my expectations of what it means to be a friend and becoming a family. Uncertainty: This time last year I knew that I was headed towards something new and I knew what that something was. However, although I know I’m headed for something new, I do not yet know what that something is and it’s a bit unnerving, I’ll admit. But, I’ll figure it out, because in life, there is no certainty, there is only adventure. Excitement: Despite the uncertainty, it leads me to excitement. It is thrilling that I live a life that allows me to constantly be on the edge of my seat. One that gives me the opportunity to do whatever I please, when I please. I’ve left my life open so that I can really figure out what it is I want and then go for it, with nothing holding me back. And what a wonderful gift to have given myself. I am leaving here with a Masters degree in Public Relations, but if you examine the big picture, that is the most unimportant thing I will depart with. I did not come here for that degree, but because that was my ticket in. Instead, I depart with experiences that leave me humbled by opportunity. I met George Clooney- a man I have admired for some time. I have seen, with my own eyes, the British royal family- a group with whom I have an unerring fascination and love. (And fear not- just because I’m not leaving as a Duchess does not mean I have given up the hope of scoring my wonderfully adorable, sometimes naked, wild-child Party Prince. So, until I do, I will be anxiously awaiting his safe return home from Afghanistan.) I’ve attended film premieres and travelled the globe on my own dollar. I’ve worked with a very important designer in a high-end fashion house. 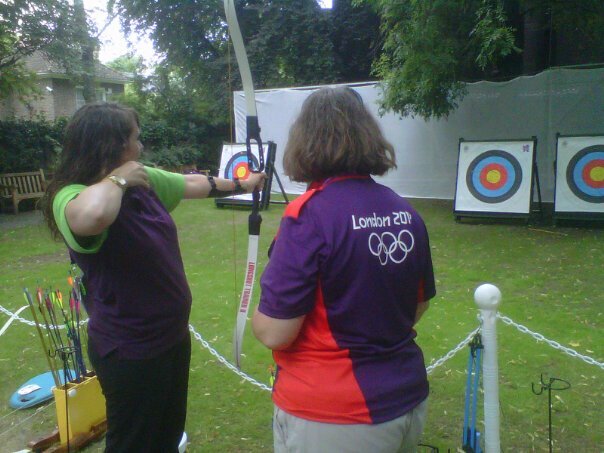 I’ve worked Wimbledon and the Olympics, rubbing elbows with some of the greatest athletes of this generation. I’ve created a life for myself. I’ve met friends from all over the world. These are the things I consider important- much more important than a piece of paper that says I’m qualified to work as a professional. Because when the job is over, these are the things and the people that will remain. These are the memories that cannot end. I do not know what would have happened and where I would be at this point in my life if I had not taken a trip to Europe for the first time in 2010. 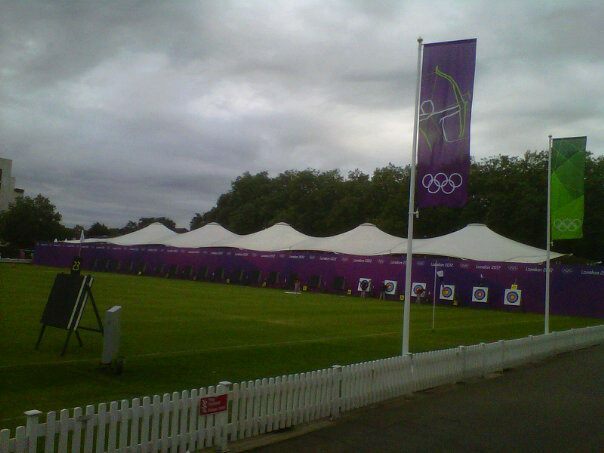 Or if that trip hadn’t been to London. The beauty of it all though, is that I will never have to know. What I do know is that I am returning to you a new person. It may not be evident to you, but it is evident to me- I FEEL different, but in a good way and I think if you take the time to really look for it, you’ll see it as well. I hope that you have enjoyed living vicariously through me. At the beginning of this journey I said my goal was to bring London home to you and I hope you feel that I have done that. I thank you for the support and the love. Your interest has touched me. The fact that you made this journey not only about me, but about you. I don’t know that anything else in life will compare to this year, but I will make it my goal to be sure that it does and I hope that you’ll be there for that as well. So, I leave you with a very humbled thank you. Keep calm and carry on. What we leave behind us is a part of ourselves. We must die to one life before we can enter another. Just taking a minute to point out that I have officially come full circle (not for the first time) in this journey. Today is two years to the day when I left America and headed for Europe for the first time. From that point on, my life changed in ways I never would have predicted. All for the better, though. I’m not sure if it’s fitting or depressing that when I step off European soil tomorrow, I will be remembering how it felt to step onto it for the first time just as dawn was breaking over London that morning two years ago. A time that feels both so far away, yet close enough to have been yesterday. Consider this a teaser for the post that will officially wrap up this blog. Returning tomorrow with the full sentiment of how greatly changed I am by this experience and what it has all meant to me. Lots of picture and words in this one. I have a lot of information to cram into one post. As my time in London begins its descent into a close (unbelievable), I have strengthened my efforts to take advantage of every opportunity that presents itself. 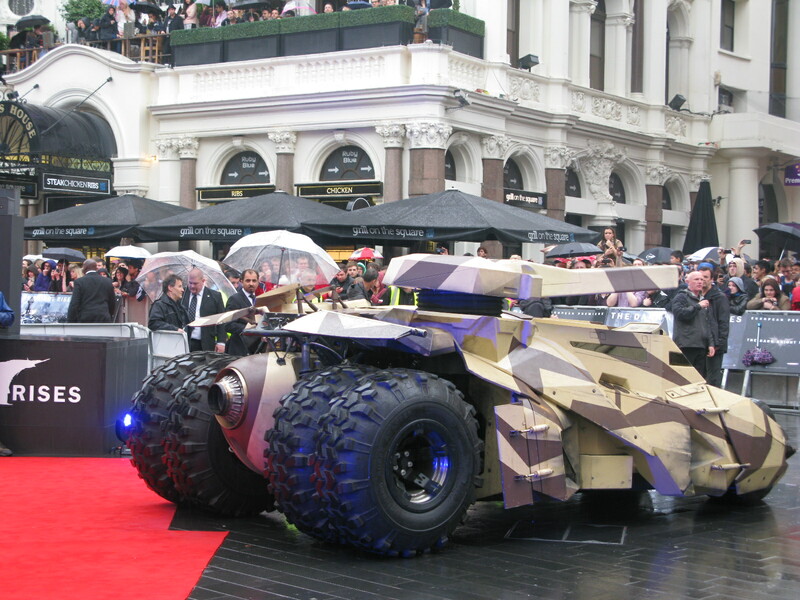 Even if that effort means standing in the pouring rain in Leicester Square for 6 hours to be a part of the most anticipated movie premiere of the year. 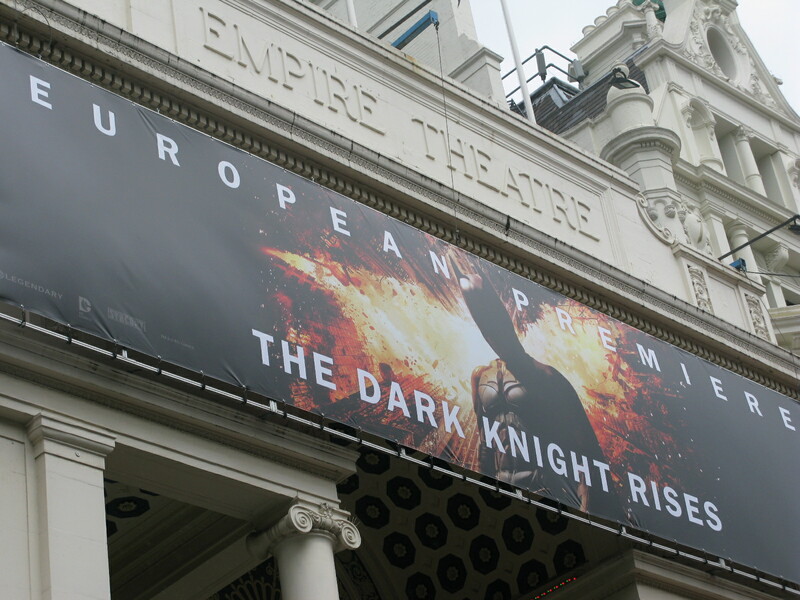 The European premiere of The Dark Knight Rises was held in Leicester Square and the full principle cast was set to attend. 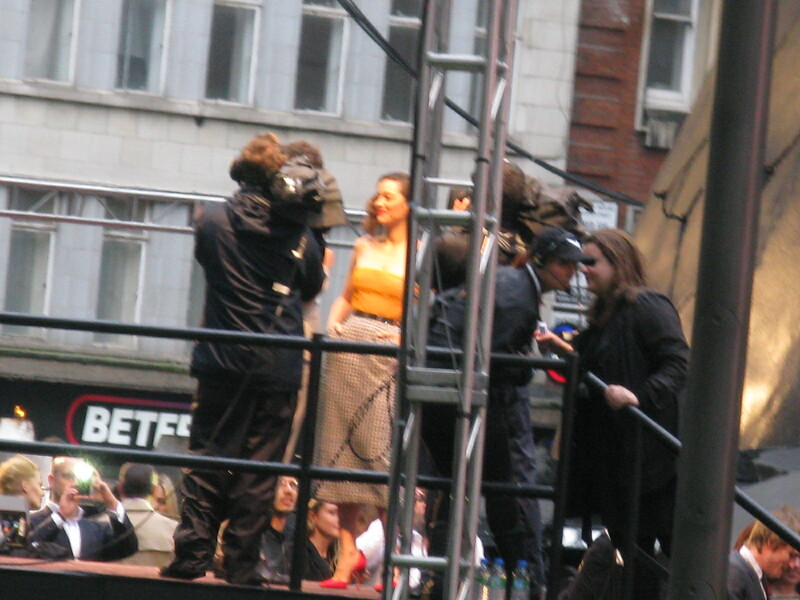 I arrived in the square at about 11 and joined the queue, which turned out to be for the garden- prime viewing spot for those hoping to catch a glimpse of some celebrities. I didn’t care if I had the best spot in the house, I just wanted a spot but I was told the line was fot TDKR, so I joined. After wasting two hours in line, we were then told we would not be making it into the garden and that we should disperse to other areas throughout the square. As I searched for a new area, I began to get a little disappointed- while I waited in line, crowds filled out the remaining areas. 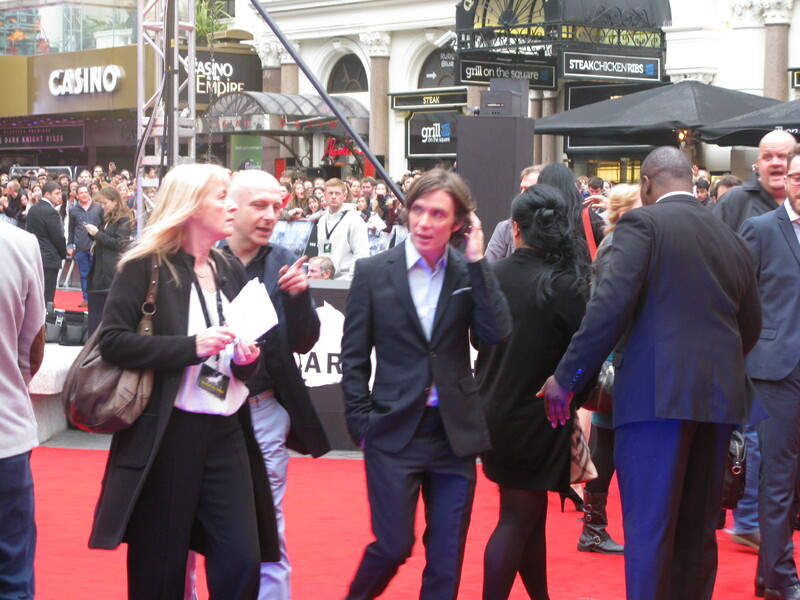 However, I soldiered on and ended up second row at the end of the red carpet. There were several times throughout the day I felt like calling it a day and going home. I didn’t NEED to see the stars and it was raining and I was hungry and my back was begging me to sit down. The hardest part is the last hour and at 4:00pm I almost walked away. But I would have kicked myself if I had gotten that close only to give up, so I stuck it out and at 5:30 the stars began to arrive. It took quite awhile for the celebrities to make their way down to us. 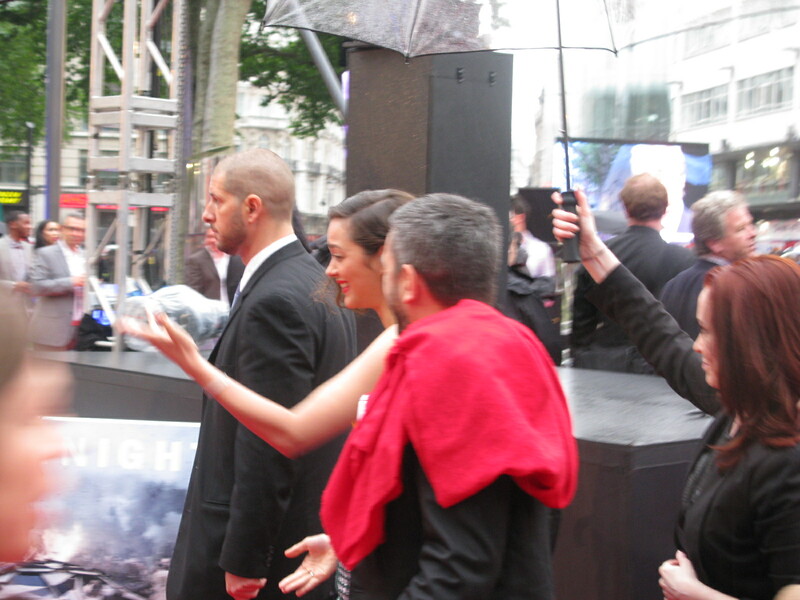 The carpet was extremely long and the cast had to make their way through the press, photo calls and autographs. But finally, they had arrived. 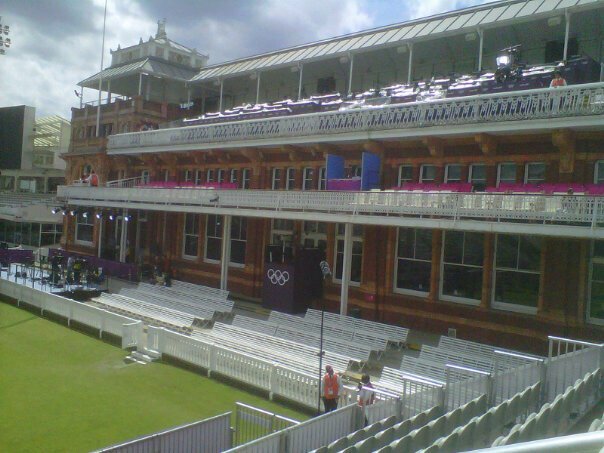 In addition to the main players, I had the fortune of seeing a multitude of other big stars, many of whom are very famous in Britain. Because the premiere was so big, it was split between two theatres. This is the Empire Theatre. I was situated in front of neighbouring theatre, the ODEON. “A fire will rise” is the film’s tagline. Matthew Lewis. 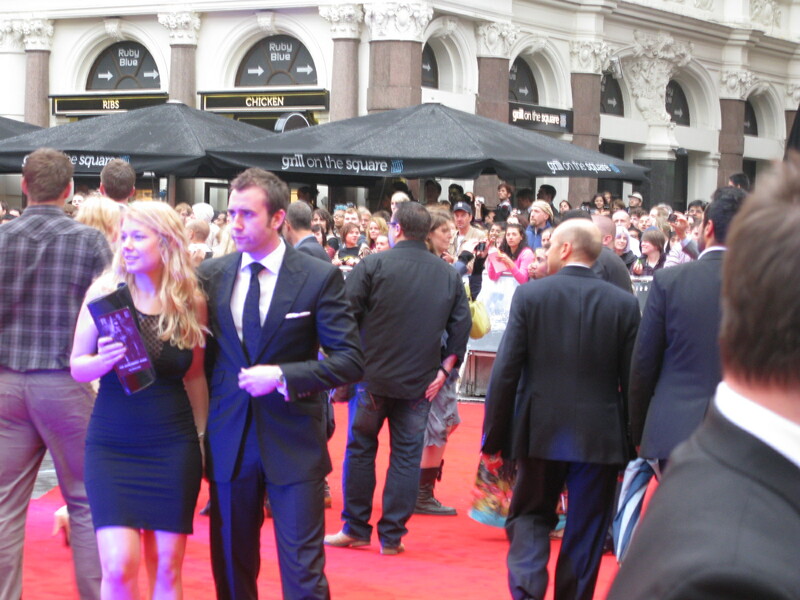 Many of you will know him as Neville Longbottom from the Harry Potter franchise. I feel that I should mention here that most of the stars of the Dark Knight did not stop to sign autographs where I was standing. I was right outside the theatre so by the time they got to where I was, there we ready to get inside. Therefore, many of the pictures are a bit blurry. 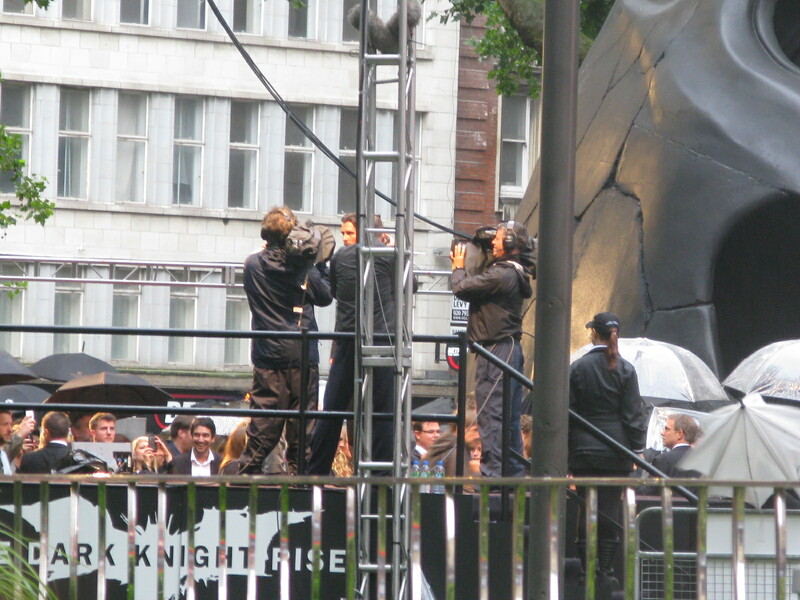 The only photo I managed to get of Batman himself, Christian Bale. 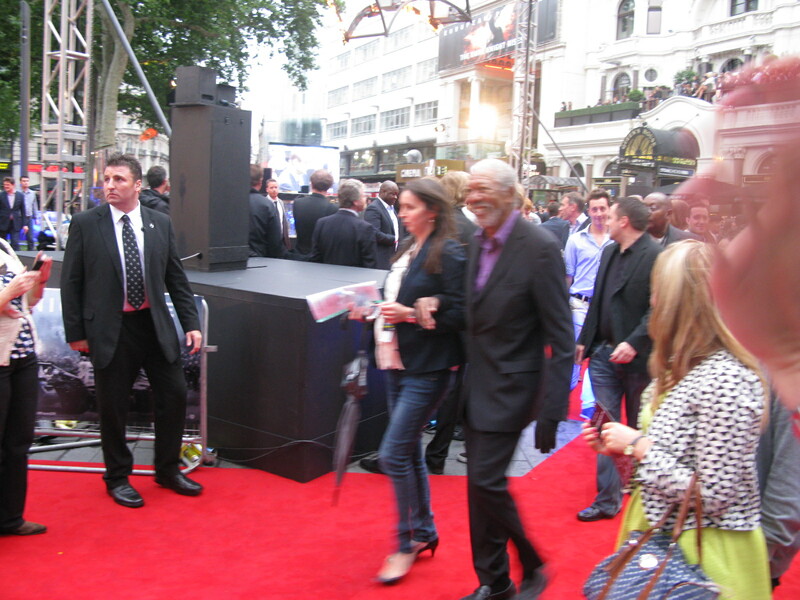 When he come up the carpet, he headed towards the other theatre so I was unable to snap a good picture of him. Joseph Gordon-Levitt. 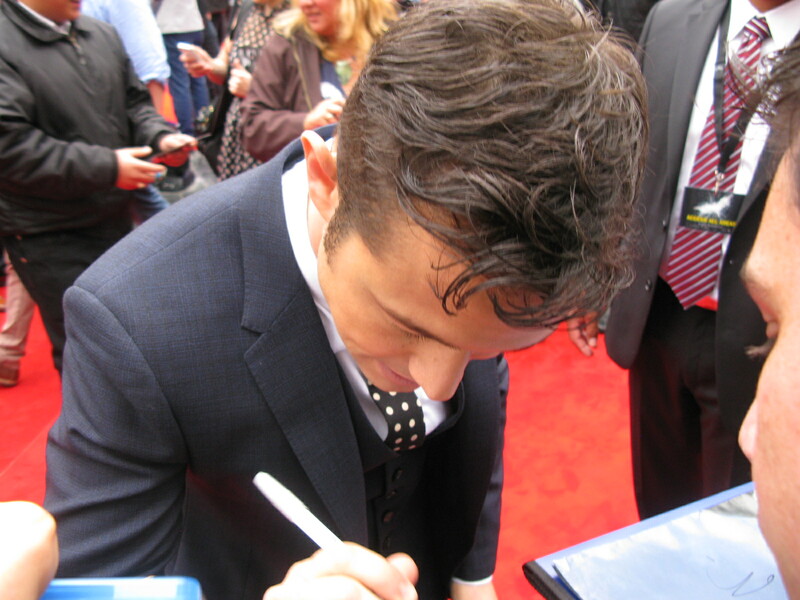 The only cast member to stop over to sign autographs. I’d be lying if I said wanting to see him wasn’t my main motivation for countless hours of standing in a crowded spot surrounded by people I don’t know. 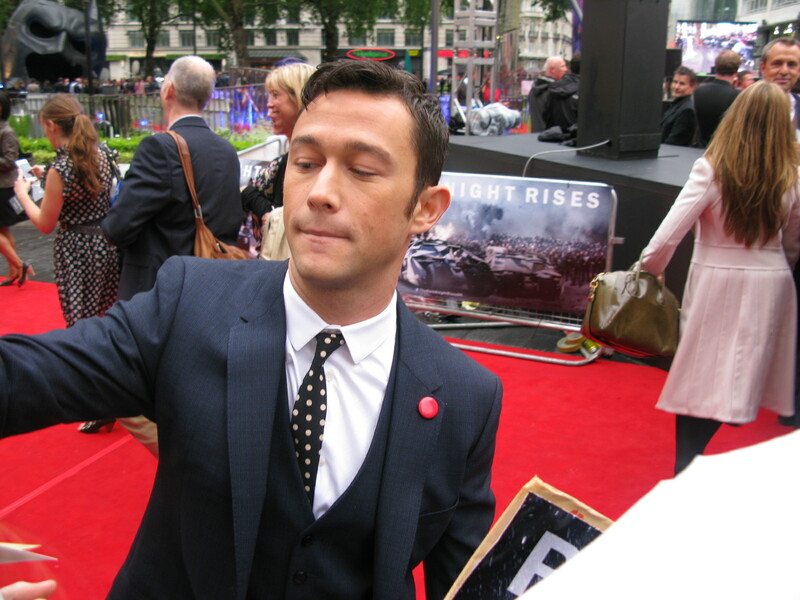 After Joseph Gordon-Levitt made his way into the theatre, I hastily made my own exit. I didn’t stick around to see Anne Hathaway- I’ve never been a huge fan of hers so I wasn’t bothered to wait around for her to make her way to the end of the carpet. So, I made my way home to video chat with my mom to tell her all about the day’s adventures and while catching up on Twitter during our conversation I saw news that, despite my incredibly good fortune (which I am not taking for granted here, I must preface this by saying), was enough to make me want to go a little bit insane. 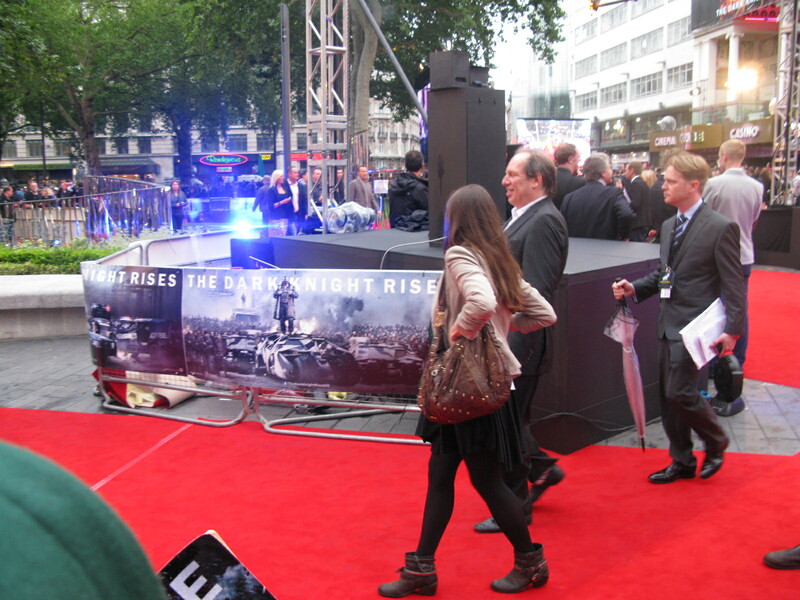 Right there spelled out in front of me was the news that Prince Harry attended The Dark Knight Rises premiere. 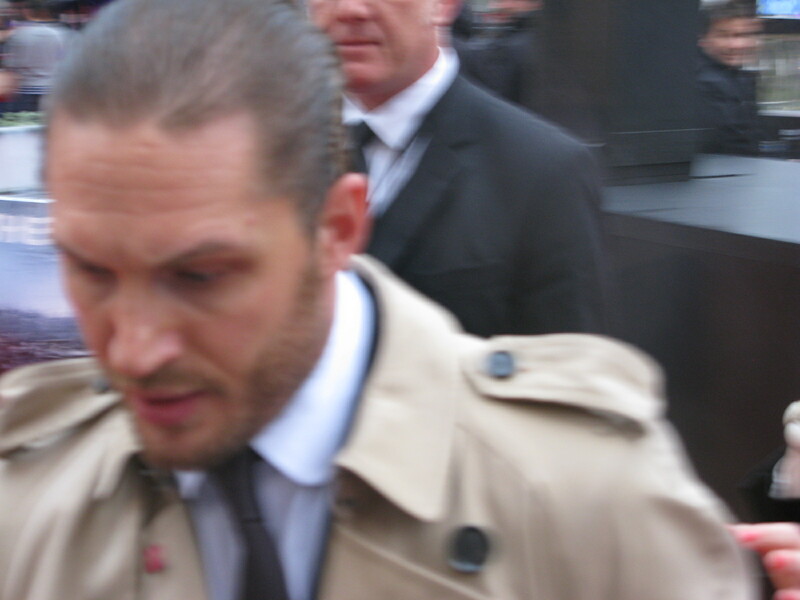 However, he obviously wasn’t aware that I was in Leicester Square because he was on the other side of the Thames River at the BFI Imax theatre in Waterloo. The conversation with my mom was put on the back burner because I could not allow myself to get over the fact that I’d missed my prince. But because it’s too good to ignore, I’ll share a picture of him from that premiere so you can see what I was missing and hopefully understand my devastation. 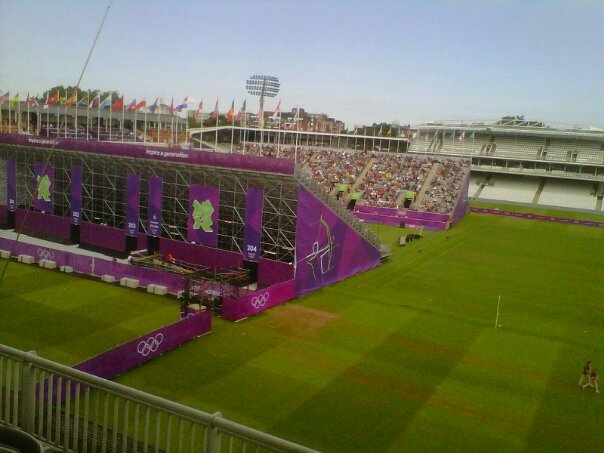 This is NOT my picture. As much as I wish it was, because that would have meant that I was there. I’m sharing it because he’s too beautiful to keep to myself even though I’d love for that to be the case. This man in a suit is God’s gift to me. The end of last night’s adventure brings me to today. Because if I can’t see Prince Harry, I’ll take his sister-in-law. The Duchess was scheduled to make a solo appearance at the opening of ‘The Road to Olympics’ exhibition at The National Portrait gallery. It was hardly publicised but I was not expecting that when I turned up, I’d be the only patron with a bunch of press photographers. I asked a police officer if it was okay that the public wait for her and he said it was fine and that I could stand anywhere. Success. I picked a spot close to the door and waited. And that’s when the homeless man struck up a conversation. Although he was very lovely and wanted to know if I like “Kate Middlespoon”, I didn’t want to spend the whole time making small talk about why the Queen should buy his magazine. So at a break in the conversation I nonchalantly moved to the opposite side of the door, out of his view. As the road shut down to make way for her motorcade, the public became even more curious and a crowd gathered. So when their sergeant alerted them that Kate would be arriving in two minutes, they pushed everyone back behind a yellow line marked on the pavement- a view obstructed by a lamppost and a traffic light. I have had some incredible luck throughout the past month regarding my ability to run into some very influential individuals, something I will get to at the end of this. 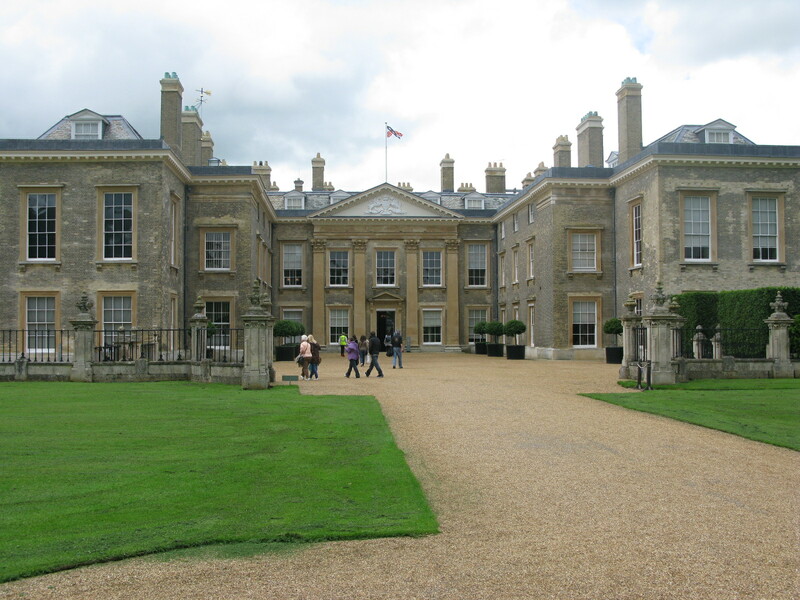 Yesterday, Jordan and I went to Althorp, the Spencer family estate where Princess Diana spent her childhood. The estate is only open from the day she was born (July 1) to the day she died (August 31). This estate has been on my to-do list since I got to England, especially having missed a visit by just one week when I arrived. I couldn’t put off a visit any longer, so we set out on a train to Northampton. This visit has been the highlight of my time here so far. The house was absolutely gorgeous, although it paled in comparison to the Diana exhibit that was featured. I could have spent hours just walking through the exhibit over and over again. Unfortunately, though, photographs were not allowed. The first room focused on her childhood. I saw handwritten letters that Diana had written to her parents, her report cards, ballet shoes and school uniform. There was also a bible that her godmother had passed along, with a personal note to Diana on the cover page. The next room was all about the royal wedding. I walked in only to be greeted by her wedding dress, which shared a showcase with the box that housed pieces of the wedding cake, a card that Charles had written to Diana featuring one of his own watercolour works and bridesmaid dresses. There was a room devoted to her charity work- Diana’s handwritten letters were once again on display, this time from years later, addressed to the heads of various organisations for which she was patron. Then came the rooms dedicated to her death. A projector flashed images of the sea of flowers placed outside Kensington Palace following the news. 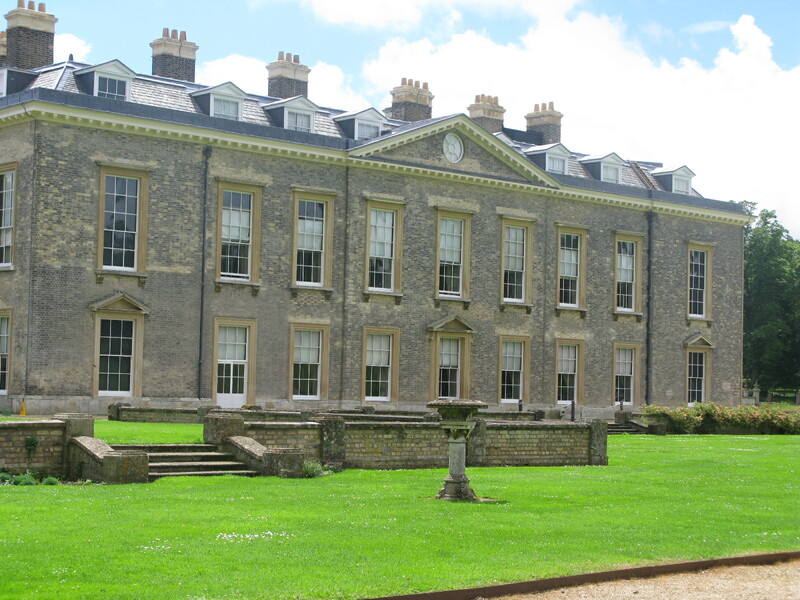 The was a case that was home to the handwritten revisions of Elton John’s ‘Candle in the Wind’, sharing a space with the handwritten draft of Earl Spencer’s eulogy. After walking through a room lined with some of Diana’s most popular (and some of my most favourite) outfits, there was a wall covered from floor to ceiling in 6-inch thick leather-bound books that were comprised of every single letter of condolence sent to Kensington Palace, St. James Palace, Buckingham Palace and Clarence House after her death. Some of the books were open to various letters, many of which were addressed to her boys. Finally, the end of the exhibit focused on the Diana Princess of Wales memorial fund- photos of her in Africa lined the walls. I vividly remember watching her funeral in 1997, knowing that the world had lost someone very special. 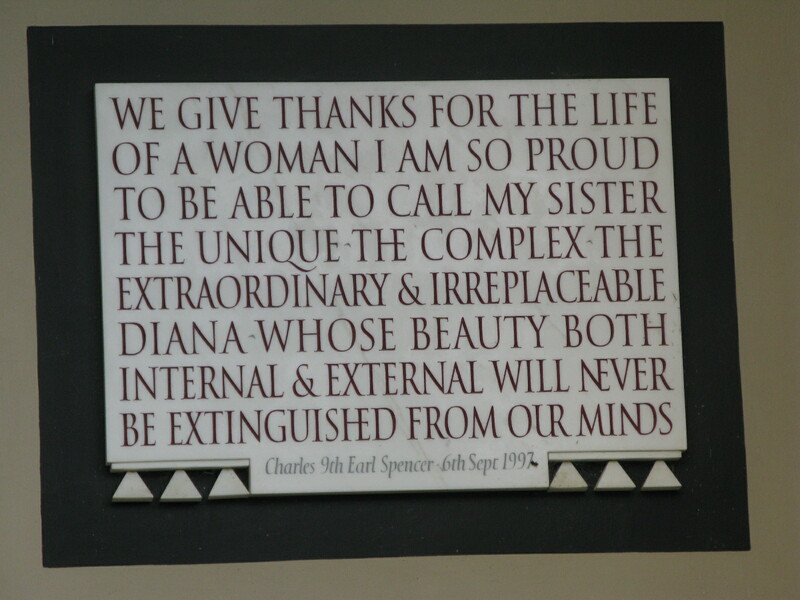 I’ve always been a fan of Diana’s, so seeing her personal artefacts was absolutely surreal to me. I still regularly wonder what she’d be like now and how she would have continued to contribute to the world. Walking around I truly appreciated the woman that she was and the woman that she likely would have been today- something hard to understand at 9. After the exhibit, Jordan and I made our way to Oval Lake, where Diana is buried. Her remains (apparently) are buried on an island situated in the middle of the lake, but I must say the state of the island is rather disappointing. 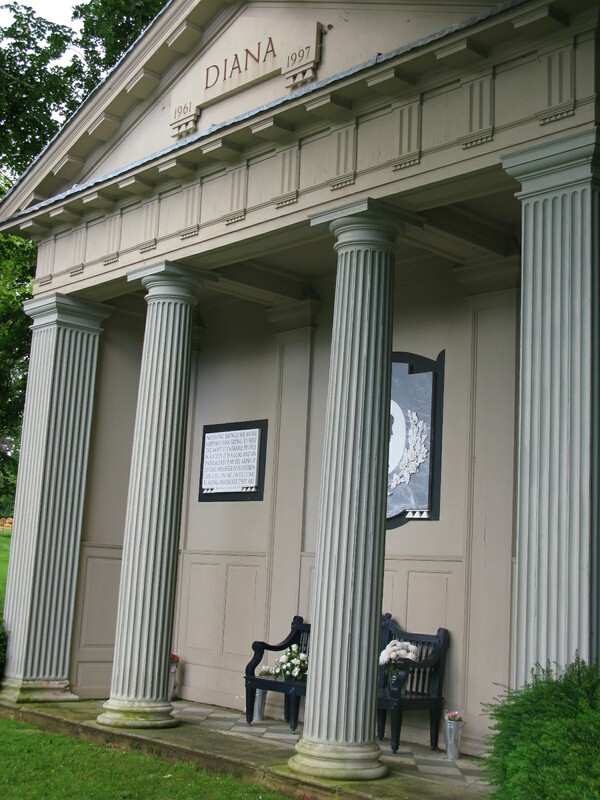 You’ll see in the photo below that the pedestal that holds an urn is almost completely overgrown by trees. 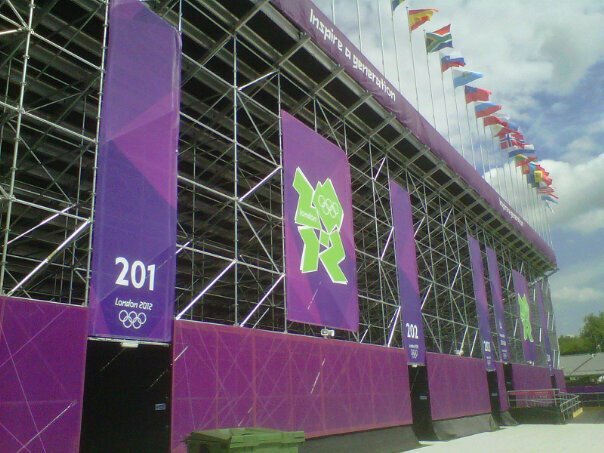 I don’t know if there is significance to this, but it is quite an eye sore if I may give my honest opinion. 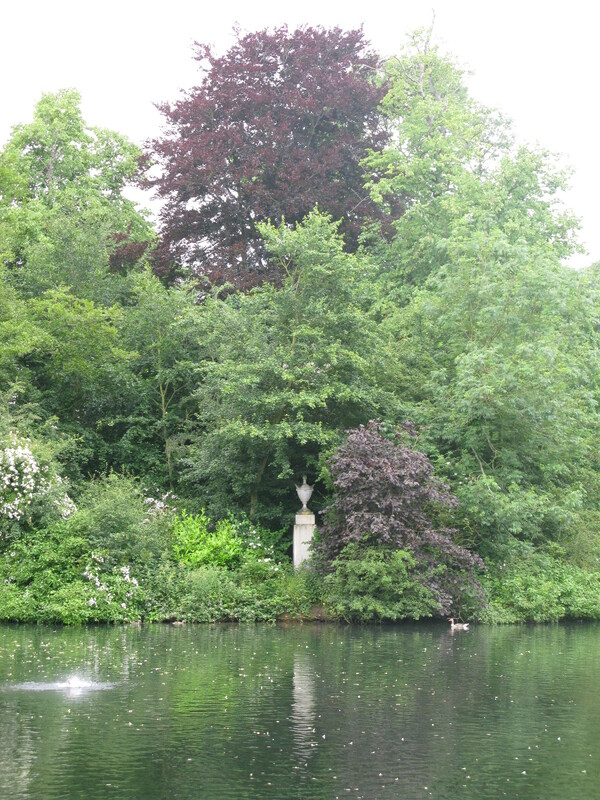 There is also a large Diana memorial at the top of the path. 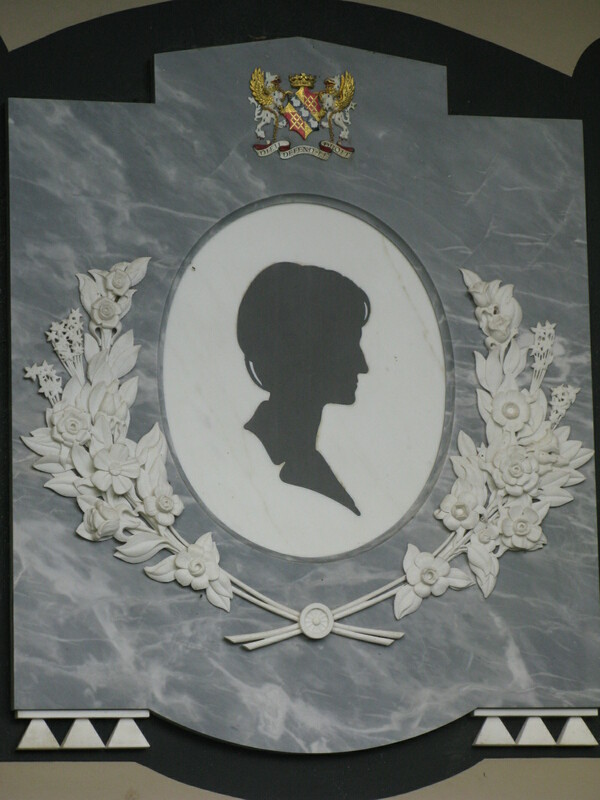 A bench that was given to her brother sits in the middle of the memorial, underneath a photo silhouette of the princess. There were flowers and cards scattered throughout the memorial, most of which were left on Sunday- her birthday. The path leading to the memorial is lined with 36 oak trees, one tree for each year of her life. Other trees are scattered about, having been planted in her memory- some of which were planted by Princes William and Harry. The Spencer estate from the back, returning from the lake. And now, finally, coming back to the topic of my luck. 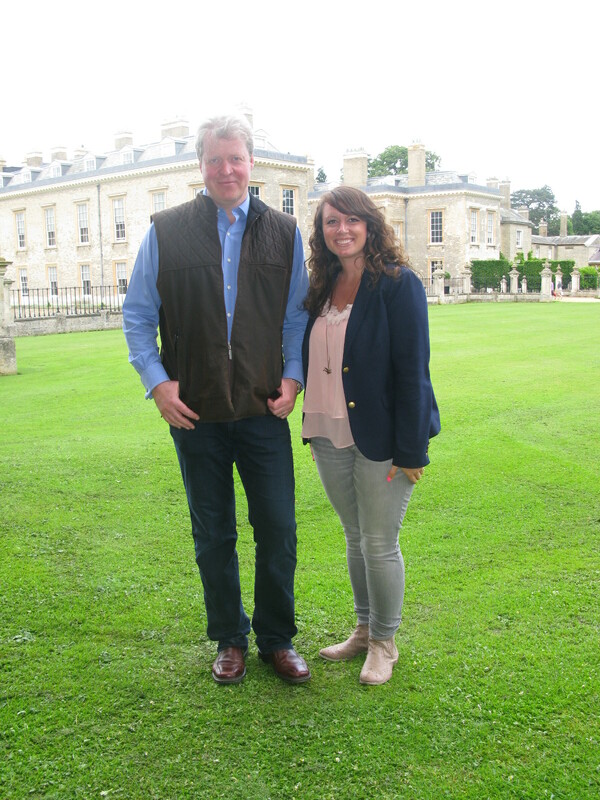 As it turns out, Earl Spencer was at Althorp yesterday. So I was given the absolute pleasure of meeting and speaking with Diana’s brother. I could not have gotten closer to her if I tried. If she was anything like him, she would have been a delight to talk to. He was very kind, taking time out of his day to sign a book that I had purchased (personalising it along the way) and posing for a photo. We spoke about school, what I’m studying and how long I’ll be here. 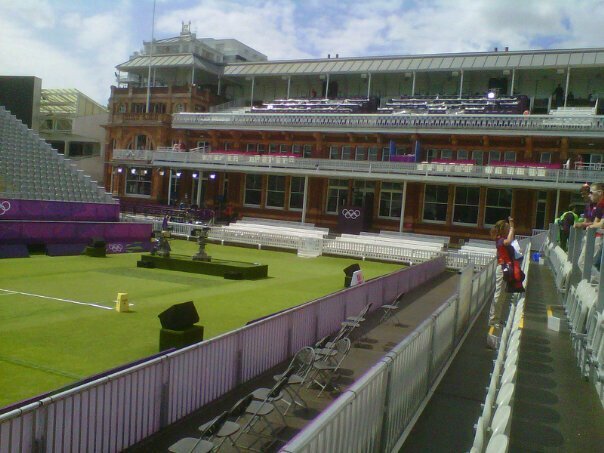 He also, noticing my American accent, told me all about a visit from The Today Show, the crew of which was at Althorp two days prior, reporting on the passing through of the Olympic torch. After snapping a photo he headed back to his office to finish up a day’s work. Jordan and I looked around inside the house for a bit and then I (begrudgingly, because I could have stayed forever) told her we could return to London.